Moderately easy - there is some climbing but it isn't steep. Quiet roads and traffic-free cycleway, with the exception of a short section on the busier main road between Porto Empedocle and San Leone. This section of route is on surfaced roads or cycleway with the exception of the last section into San Leone, however you can avoid this by staying on the main road for another couple of kilometres. Well signposted (please note where the route described here differs from the signposted route). The next stop after Marinella is Selinunte is Porto Palo di Menfi. If you want to spend some time at the beach, this would be a good place. After Porto Palo I had a really pleasant surprise: an old railway line now converted into a cycleway. The tarmac in good condition – although you can't say the same about the wooden safety rails on the two sides of the cycleway. A lot of sections have collapsed – I don't know what has happened here but there can't have been that many hapless cyclists crashing into them. The cycleway climbs steadily towards Menfi, but stops just short of the town itself. At the end of the cycleway you turn right, onto a gorgeous stretch of quiet, tranquil, road where you might meet the occasional car. 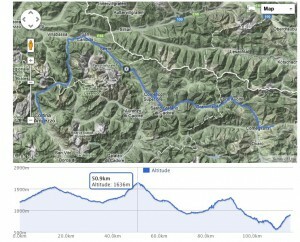 There are a couple of short climbs along the way but nothing too taxing. The final stretch into Sciacca on the SP49 another great very quiet cruisey road. The landscape isn't spectacular but it has a subtle charm with its rolling hills and wildflowers. Sciacca is walled city on heights overlooking the port - there's a compact centro storico. For me the most memorable feature was the piazza with a belvedere and a dense arcade of trees with the branches that seemed to be absolutely filled with songbirds. The SIBIT route drops down to the port area but if you want to visit the centro storico it's a fairly steep climb up. The road out of Sciacca is fairly busy. You need to continue straight on at the junction with the SS115. The road (which I'm guessing was the old strada statale ) stays fairly close to the SS115 as it strides across the countryside on concrete viaducts. Eventually you have to join in SS115 for 8 kilometres before turning to make the climb to Ribera on another strada statale (the SS386). The climb isn't partic­u­larly inter­esting, but that changes as you reach the round­about at the edge of town and head downhill onto the SP61, enjoying panoramic views olive groves, vineyards and orange trees. I stuck with the SP61 at the junction where the SIBIT route heads for Bonsignore. I'm glad I did – it was a bliss­fully quiet road. The road heads towards the summer resort of Eraclea Minoa which is named after the nearby arche­olo­gical site. The ancient Eraclea Minoa is defin­itely worth a visit - turn right just before the road goes downhill into the modern village. 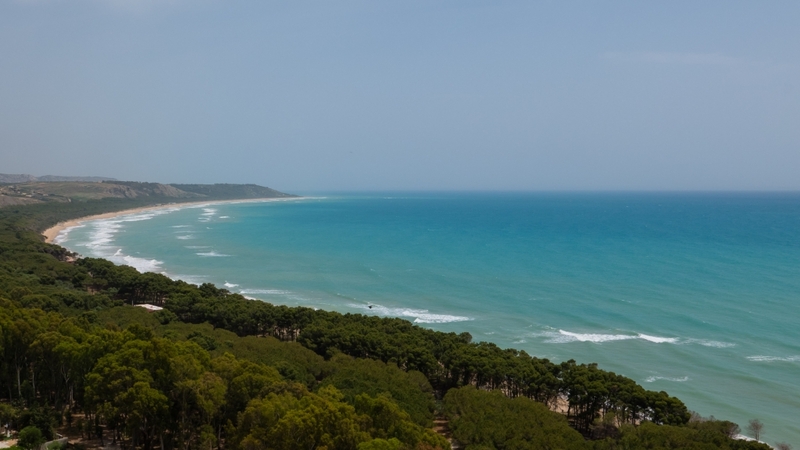 There's not much there, but the setting is absolutely fabulous with views in one direction over the long curving bay of sand beach and a coastal pineta (pine woods) and in the other direction there's the Punta Bianca. Ancient Eraclea has a small theatre overlooking the sea, but it was built on very soft stone which means that the tiers of seats are badly worn and a roof has been built over it to protect it from the wind and rain. There's not much in the modern Eraclea Minoa either - a beach­front restaurant and a campsite (with bungalows). The resort seems to be one of those places that's busy in the peak season , but the rest of the year is very quiet. The beach is glorious though. 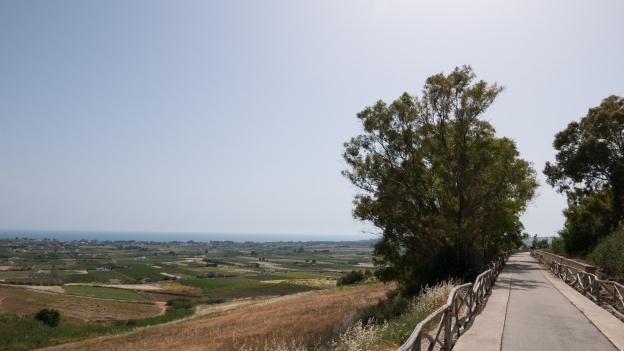 The next section of the route takes you on towards Agrigento and the Valley of the Temples. 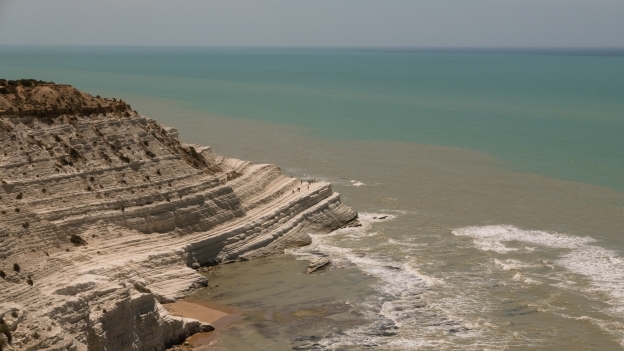 The SIBIT route takes you to San Leone (the Marina di Agrigento). 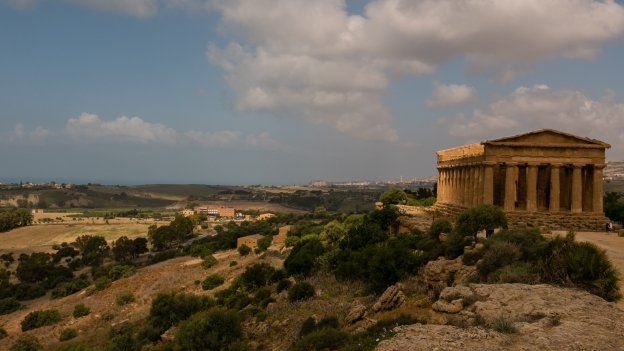 The Valley of the Temples lies between Agrigento and San Leone, and is easily accessible from both. 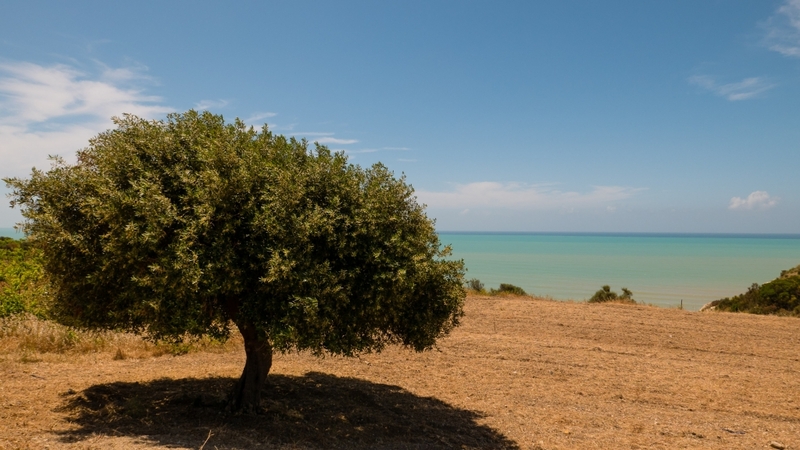 Agrigento is the main town and has the most accom­mod­ation options however San Leone seems to be much easier to get to by bike. I departed from the SIBIT route going from Eraclea - the the most fuss-free option is simply to retrace your steps to the SP61 and follow it to Montallegro (Happy Mountain). The SIBIT route has a sign warning of 1.3 kms of sterrata (dirt road/​gravel track) with the dreaded words bici a mano – ie stretches where you have to get off and walk. It may be that this sign was unneces­sarily pessim­istic - but I decided that for the sake of a few kms it wasn't worth the risk. After Montallegro you continue on passing the entrances and visitor centre for the Torre Salsa nature reserve ( WWF Torre Salsa Oasi). Then there's an abrupt right turn (look out for the SIBIT sign), this takes you onto a narrow road, that felt abandoned, and I felt that I would soon have to turn back, but at the end of a short climb I was rewarded with a view of the Marina di Siculiana. The road widens at this point. If you're a feeling risk averse you can stay on the SP61 which runs beside the SS115. The landscape gets wilder and more arid after Montallegro - especially after Siculiana. 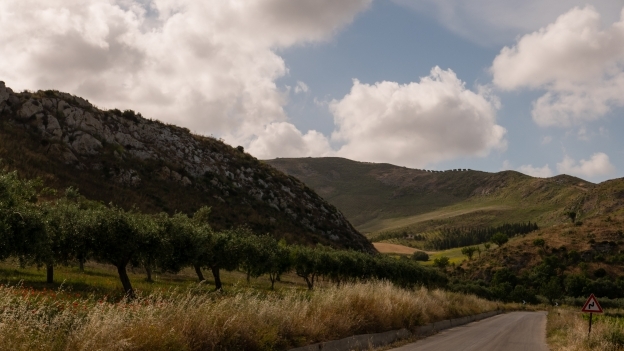 As you follow the route, ignore the signs for Agrigento as these steer you back onto the SS115. As you approach Siculiana, bear right and follow a narrow road with the city to your left. This road heads for the spiaggia di Siculiana, but at a certain point you need to make a sharp left onto a narrow road that takes you towards Realmonte. Again the route takes you past the town itself, with the town above you and on your left. 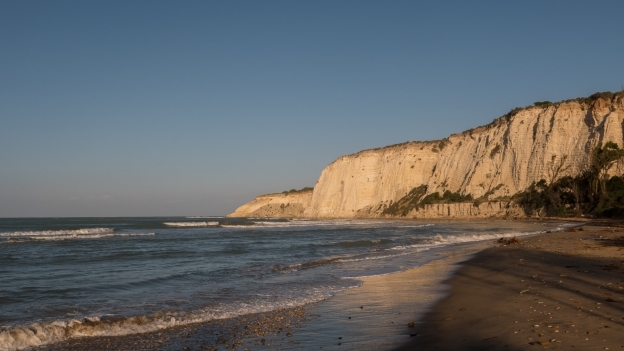 The road on this stretch, is not partic­u­larly scenic, but keep an eye open and the Scala dei Turchi (the steps/​stairway of the Turks) as you turn left onto the SP68 as it heads for Porto Empedocle. The scala is one of the most dramatic and scenic spots on the whole Sicilian coast. There's a viewpoint just beyond the point on the road where it first comes into view. Porto Empedocle is named after the Greek philo­sopher Empedocles who lived in Agrigento, but its most famous son is the writer Andrea Camilleri (en.wikipedia.org: Andrea Camilleri) best-known for the Commissario Montalbano series of novels -and television films (en.wikipedia.org: Inspector Montalbano). Agrigento's most famous son, on the other hand, is the dramatist Luigi Pirandello (en.wikipedia.org: Luigi Pirandello). The Montalbano novels are set in the fictional town of Vigata (based on Porto Empedocle) and Montelusa (Agrigento). Inspired by the success of the novels, Porto Empedocle has changed its name to Porto Empedocle Vigata, and even the power station has been renamed and is now the Centrale Termoelettrica Vigata. The official route turns right off the SS115 and heads for San Leone along a fairly rough dirt road. While it's peaceful (and was a relief from the SS115), I'm not sure it was worth it just to avoid another kilometre or so on on the main road, especially as the section towards San Leone is downhill - if you're going towards Porto Empedocle the dirt road becomes a much more attractive altern­ative. There isn't an easy way to get into the Agrigento avoiding the major roads. The only option that I can see that avoids the major roads is to take the road that joins Agrigento and San Leone. This is a fairly busy road though, and one that I would avoid if I could - it's not a climb I'd want to make at the end of a long day. If you only go to one archae­olo­gical site along the route then it would probably have to be the Valle dei Templi (Valley of the Temples) (en.wikipedia.org: Valle dei Templi). The parco arche­ologico is open all day every day, between mid-July and mid-September it's also open between 19:30 and 22:00. The most useful site for inform­ation on opening hours etc is valleyofthetemples.com a site set up by local guides. The valley is not really a valley at all, unless you're looking down from the heights of modern Agrigento: from pretty much any other point the temples are on a ridge overlooking the coastal plain. There are three main temples: the most complete is the Tempio della Concordia which is linked to the Tempio di Giunone (Juno) by a Via Sacro. On the other side of the road are the remains of the Tempio di Ercole (Hercules) which in its day would have been the most spectacular of all. To get an idea of the scale, go to the archae­olo­gical museum – in the museum there's one of the figures that formed part of the decor­ation of the Temple. The huge 8-metre high figure would have being only half the height of the Temple. A model in the Museum gives an idea of what the temple would have looked like – although there is debate over whether it was ever completed. The ‘Valle dei Templi’ is also a little misleading that this was the site of the ancient city of Akragas – the entrance takes you through one of the gates of the city. Another is used by the road which unfor­tu­nately cuts through the site. Up the hill from the temples is the Agora – with a capacity seat 3000 people (or at least 3000 men - slaves and women presumably weren't invited). 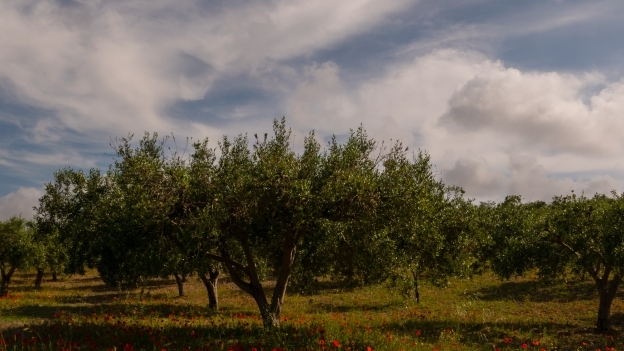 Akragas achieved the height of its glory almost around 480 BC with a victory over the Carthaginians – but a second conflict 75 years later saw the city's defeat and destruction. Although it did revive, it never achieved its former power. The old city was progress­ively abandoned as people settled on the heights above - where the modern city now is. The most convenient campsite for visiting the parco arche­ologico is the Camping Valle dei Templi in San Leone. (There's also a very good ristorante - the Leon d'Oro - just across the road). With direct trains to Palermo and a journey time of just under two hours if you can't do the whole route then Agrigento would be a good place to start (or finish). You could also take the train to Catania although this is a little less convenient as the journey involves a couple of changes.